structures using the Astro DL COVER. All service holes through floors and compartment walls must be fire stopped to prevent the passage of fire, smoke and hot gases. Downlighers in ceilings are widely used in commercial buildings. Each ceiling is subject to fire regulations and where applicable the ceiling construction needs to be fire rated. 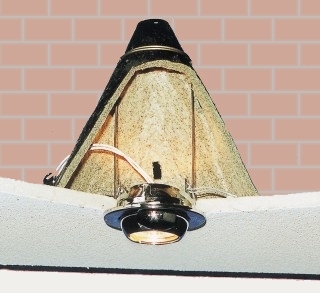 However, once a hole has been made in the ceiling for a downlighter, the integrity of the construction and its ability to perform in a fire can be reduced significantly. To combat this the ASTRO DL Cover has been developed to cover maximum protection for holes created by the introduction of a downlighter and to allow for maximum ease of fitting. To install FH DC150 - FH DC200 - FH DC250 covers. Grasp legs firmly and roll cover into a tight cylinder. Ensure wiring loom is through slot before installation. Keeping a tight grip on the legs, feed the cover through the cut out made for the downlighter. Ensure cover has sprung back into its original cone shape. (a) Grasp legs and pull down until L section clears the underside of the ceiling. (b) Move legs out until vertical part of L section normal.is flush with the side of the cut out. Release legs so that they grip the underside of the tile.Remove the excess of both legs. 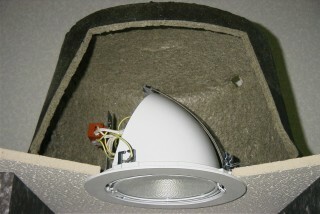 Cut at point A.Once cover is in place, downlighter can be fitted as normal. To install FH DC300 or FH DC350 Covers. ..... and then folding it in half again. Step Three: Pass the folded cover through the aperture. Then fit the downlighter cover as per the manufactures's instructions - cables may be pushed through the vent slots in the cover. Check and ensure that there is a distance of 20mm minimum between the downlighter cover and any insulation or acoustic filling in the void. Remote gearboxes and transformers must be situated outside of the downlighter cover. Intumescent downlighter covers are manufactured in the EU, meeting the highest quality standard in compliance with ISO EN 9001:2000 . Astro DL Covers should be stored indoors. No shelf life is given as this product will not deteriorate in storeage. As part of our policy of ongoing improvements, we reserve the right to modify, alter or change product specifications without giving notice. Product illustrations are representations only. All information contained in this document is provided for guidance only, and as TLC has no control over the installation methods of the products, or of the prevailing site conditions, no warranties expressed or implied are intended to be given as to the actual performance of the products mentioned or referred to, and no liability whatsoever will be accepted for any loss, damage or injury arising from the use of the information given of products mentioned or referred to herein.